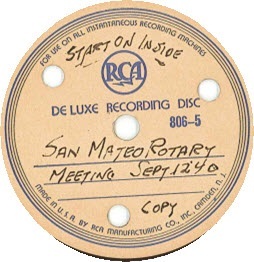 It was, perhaps, inevitable that San Mateo would found a Rotary Club in 1924, following the footsteps of its sister club in the north. San Francisco’s was the second Rotary Club in the movement, formed after the earthquake and fire of 1906 as a tool of recovery for that city.  It adopted all the guiding principles Paul Harris established when he created the first club in Chicago in 1905 as a way to boost business. San Mateo was located in the center of the grand estate area favored by San Francisco’s business, banking and financial elite. Though it was not exactly a hub of urbanization in 1924 — only 37,000 people lived in the entire county at the time — San Mateo accounted for nearly a third of the area’s population, was a distinct business hub and counted among its denizens several who were active in the San Francisco group. 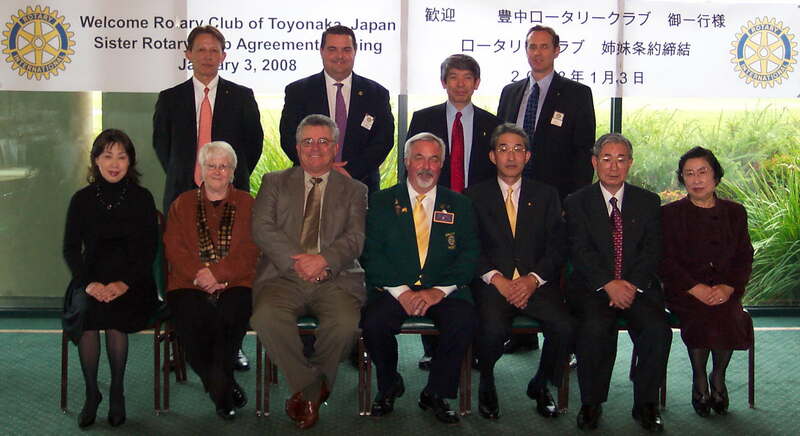 Founding era Rotary clubs were “booster” clubs organized to build a network of business for a closed circle of members. A strictly-enforced roster rule limited membership to only one practicing business man from any particular business category. Members solicited one another; the San Francisco club of the early 20’s even made certain members’ wives knew who was in the club so they would patronize only members’ businesses. World War I changed Rotary clubs, adding an element of community service that prevails to the present era. Eighteen prominent men in the community petitioned Rotary for a charter, which was granted on Jan. 25, 1924. Oscar Boldemann of San Mateo Park — which continues today as one of the most desirable districts in the city to live — presided over the founding meeting of the club. Boldemann owned Boldemann Chocolat Company at 444 Townsend St. in San Francisco. First club president was attorney J.E. McCurdy, who also served as a very active member of the local Elks Club. Secretary W.L. Glascock, another Elk, was superintendent of the San Mateo Union High School District and San Mateo Junior College. Treasurer P.A. Oliver was President of the Peninsula Building and Loan Association. First Sgt.-at-Arms, still a highly valued position in the club, was Albert A. Rochex of Rochex and Rochex Real Estate. Rounding out the roster of 16 of the known founding members were Horace W. Amphlett, owner and publisher of the San Mateo Times newspaper; Fred. E Beer, owner of the local Ford automobile dealership; Walter E. Cambridge, Rector of St. Matthew Episcopal Church and President and Resident Manager of Mills Memorial Hospital; Charles J. Ekinhardt, optometrist; Walter T. Kelly, manager of the local PG&E office and president of the Sequoia Union High School District; N.D. Morrison, a physican; G.S. Perkham, manager of the Dairy Delivery Company; Fred. J. Smith, owner of the Frederick Smith Furniture Company; George W. Snieder, owner of George W. Snieder Mortuary; R. J. Wisnom, owner of Wisnom Hardware; John R. Fairbanks, superintendent of Leslie Salt Works and Mervyn A. Hope, manager of California Pacific Title Co. 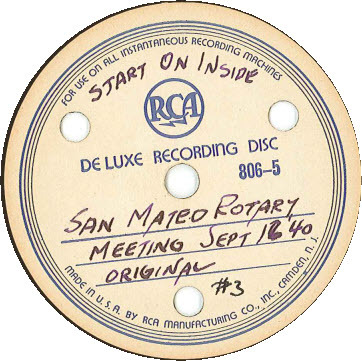 Though many things have changed, the distinction of San Mateo Rotary membership has always been valued in the community. In 2007 the club still has representation from Mills-Peninsula Health Services, successor to Mills Hospital, the San Mateo County Times, successor to Amphlett’s San Mateo Times, the community college district, the high school district and even Wisnom Hardware. Women were first accepted for club membership in 1987, with three joining that year. They were Barbara Evers, representing Borel Private Bank & Trust Co., Lynda Poulton, office manager of Leasemobile/California, and Anne LeClair, at the time executive director of the San Mateo Chamber of Commerce. LeClair became the club’s first female president in 1994. The Rotary Club of San Mateo received 3 records that were found in a garage in Edmund, Oklahoma. The person who found these records found our Rotary club website, and sent us an email to see if we wanted these recordings. Jim Engel converted the 78 speed records to digital format, and below are links to the recordings so you can hear them for yourself. I think T.Jack Foster is a better band leader than they had back then, but they sang similar songs to what we do in our meeting today! Enjoy, LISTEN to audio from 2 meetings from September, 1940. Click on each album label to hear the audio.